Our unique proprietary formula for relief of dry eyes, dry mouth, joint pain, fatigue and more related to autoimmune conditions. This formula restores normal cell functions to tear secretion glands and salivary glands as well as regulates the immune system to reduce flares. We recommend TheraLife® Eye Autoimmune plus TheraLife® Omega-3 Fish Oil and TheraLife Fatigue as a total solution for individuals who suffer from dry eyes related to autoimmune diseases. Have your own fish oil? Need to use flax seed oil as a vegetarian substitute? 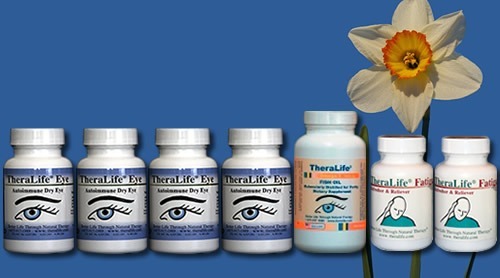 You may purchase TheraLife® Eye Autoimmune only. We do recommend adding TheraLife® Fatigue (2 bottles) for a total solution.